When the iPad was released, many decried its lack of connectivity. In keeping with its position in the iPhone OS lineup, the iPad is designed to be a companion to a full-fledged computer, not a replacement–you can’t plug in any external gadgets like hard drives, USB flash drives, MP3 players (including iPods), printers, or cameras. Apple does offer the $30 Camera Connection Kit, however–and people have just started figuring out what it can do. The Camera Connection Kit consists of two dongles, one with USB and one with a slot for an SD card. It’s designed purely for cameras, and imports photos directly to the Photos app (no messing about with albums or files). 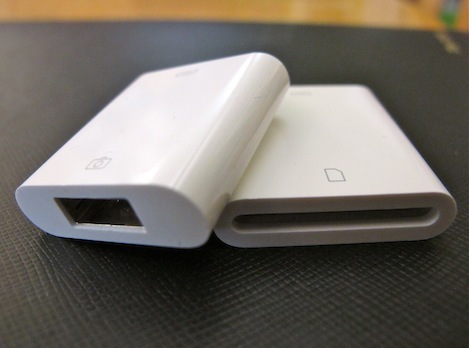 But that USB is a little more promising–what else can connect to the iPad? TidBits discovered you can connect pretty much any USB headset, headphones, or microphone, which turns the iPad into a pretty decent little Skype device (with better quality sound than you’d get with Bluetooth). USB keyboards also work, but are incredibly awkward since the dongle renders the iPad unable to sit upright in a dock. As for photos, the iPad will take all your photos at full resolution, including EXIF data, but videos don’t fare as well. Videos will be shrunk down to a maximum of 5MB and a 640×480 resolution–bad news for those with even a modern pocket camcorder like those made by Flip. Overall it’s not great news–we were kind of hoping the USB dongle would be more useful than just supporting microphones. But it’s not really unexpected.